To keep tanks clean(er), I decided to use plants that grow well and root well in water as filters. 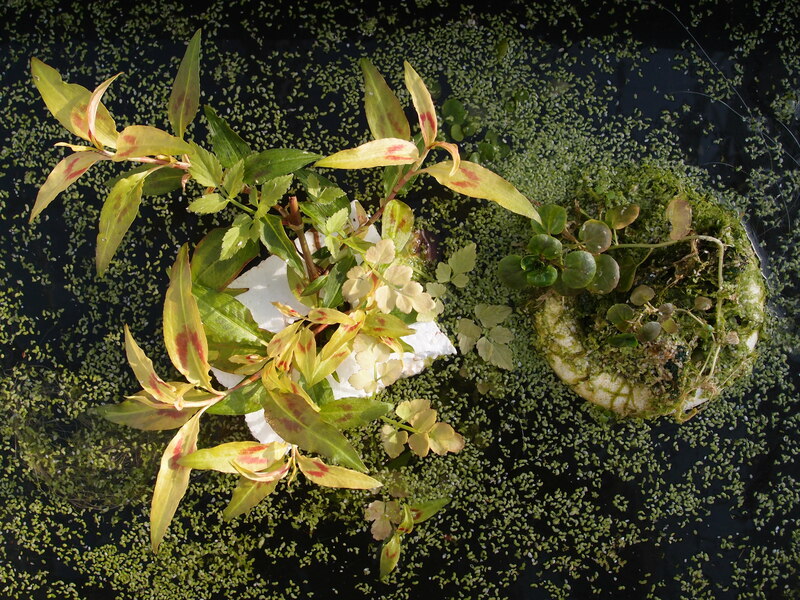 Here on the photograph three different plants on small floating islands in my fish basins, situated in an unheated greenhouse. They all grow through winter. Leftmost: Vietnamese coriander (Persicaria odorata), middle: Japanese parsley (Oenanthe javanica), right: watercress (Nasturtium officinale). What’s really great is that the plants need to be kept growing to make them take up nutrients. What helps well for that is harvesting them, and all three are edible. Aquaponics in its simplest form. This entry was posted in Chitchat, Experiments, Maintenance, Tanks by tvdooren. Bookmark the permalink. For the 5-7 cm ones, a trio is the limit for that size of tank I think. In retrospect, this worked so well that the plants stopped growing after a while, due to insufficient nutrients in the water. I did remove all dead leaves regularly and harvested twice over winter. Persicaria odorata did best.